Lucille’s Creekside Hideaway is the perfect vacation spot. Nestled in the trees along a creek the sounds of the rippling water will sooth all stress. This 3 bedroom 3 bath creek front property comfortably sleeps 8 and has all the amenities of home while enjoying the beauty of nature. Sit outside on the deck and enjoy your morning coffee in the trees. Relax in the Hot Tub after a day of adventures in the mountains. Sit on the lower deck and listen to the creek run or take a hike. Once home you can enjoy a friendly game of pool or foosball or roast some s’mores on the outside fire-pit. Cuddle up to a warm fire in the beautiful Gas Log Fireplace. This home will not disappoint. Located in the quaint mountain city of Blue Ridge be sure and visit it’s one of a kind shops and gourmet restaurants. Zip-Line, Horseback Ride, Kayak, Tube, Paddle Board, Hike the Appalachian Trail or to one of the area’s beautiful Waterfalls, all right at your finger-tips! Lake Blue Ridge, sitting between the mountains is a perfect spot for summer water sports. Lucille’s is easily accessible from the main road and all of the roads leading to the home are paved. Come on up and start making memories! We have stayed with Mountain Laurel Cabins 3 times since August 2018 they have been wonderful... If anything is wrong they accommodate us each and every time!!! All the cabins we have stayed in have been clean and great . . We will be going back !! Everything was beautiful .cabin clean and roomy this cabin was all that and much more me and my family don't have not 1 complaint and we will be back just loved everything about the cabins and checkin and out process was so easy and hassle free.so much to do around there too.everything in picture was exactly as it look you will not be disappointed love it Love it. The cabin was ideal for our group weekend getaway. Special, clean, well stocked, nestled in the most peaceful environment. The stream was an added plus! We really enjoyed our stay, especially he screened in deck and the beautiful deck down to the woods. Everything ever needed in a kitchen, is there!! 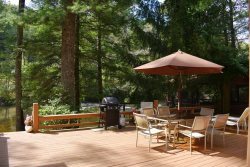 Beautiful cabin, spacious, gorgeous view/scenery enjoyed the amenities, pool table, foosball, & hot tub. Tranquil & peaceful experience. Simple and friendly from start to finish! Beautiful newer cabin with a great location, wonderful amenities and perfectly stocked! Beautiful, clean, full of activities! We loved it! Thank you for letting us stay in your home! Very new, clean, and great place to spend the weekend up in the mountains.